If it was tough to maintain the rhythm of this beaded knotted band in a line, it was much harder to work it around shapes, but it was interesting too. The band is worked over straight stitches in leaf shape [?] 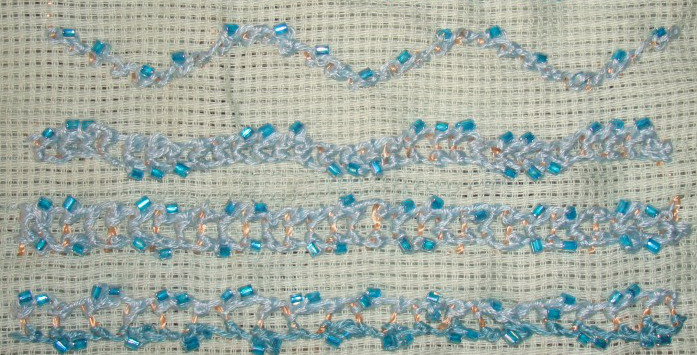 in the first sample, beaded knots worked on buttonhole stitch variation in the second sample. the band are worked around Algerian eye stitches in the third sample. 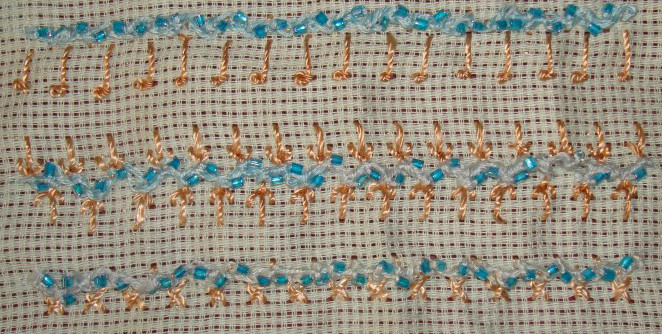 Chain stitch is worked in the centre of the band in the fourth sample. Band worked over satin ribbon couched with straight stitches. Before working the band, the leaf and Algerian eye looked like this. 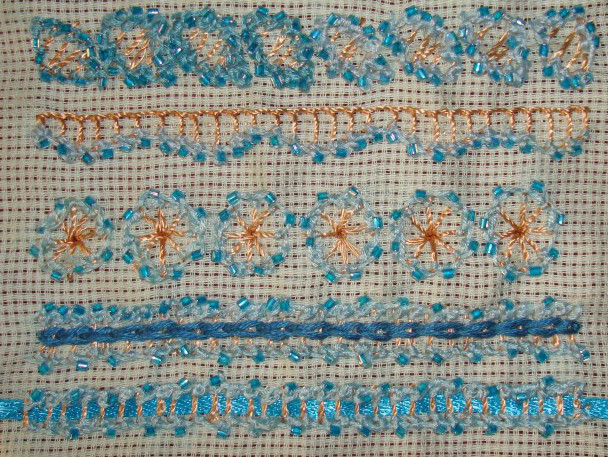 Other stitches are worked with these beaded zigzag bands in this part of the sampler- pistil stitches, fly stitches and cross stitches. The fly stitches are lengthened to work the beaded zigzag band. The sampler was completed with these samples. I enjoyed working this band, though the way the beads and knots behaved were totally unpredictable. Sometimes I wanted to avoid the knots after adding the beads, which I did at some places, this was also interesting. This long named stitch needs to be practiced to be worked comfortably. I am yet to reach that level. The tutorial for this stitch is available on SharonB’s blog. 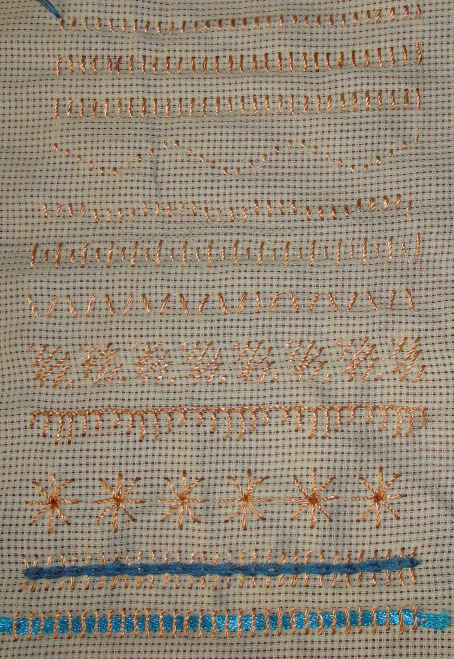 I started this sampler with some variations of straight stitch bands. Working this stitch given by Sharon in the first sample, moved to stitching beads to the lower part of the stitches in the second sample. The beaded knots are alternated in the top and bottom stitches in the third sample [I wonder, whether this can be understood, if not see the picture].